- Best Urban Regeneration Project. Kalijodo Park, Sinar Mas Land. - Asia Pacific Property Awards 2018. Sinarmasland, Developer Website - www.nuvasabay.com. - Asia Pacific Property Awards 2018. BSD City, Sinar Mas Land. - Asia Pacific Property Awards 2018 Park For Office Development. BSD Green Office, Sinar Mas Land. - Asia Pacific Property Awards 2018 For Public Service Development. Kalijodo Park, Sinar Mas Land. - Asia Pacific Property Awards 2017. Sinarmasland, Developer Website - www.sinarmasland.com. - Asia Pacific Property Award 2017 For Development Marketing. Nuvasa Bay, Sinar Mas Land. - Asia Pacific Property Award 2017 For Retail Development Q-Big. BSD City, Sinar Mas Land. - FIABCI World Prix d’Excellence Awards 2017, Purpose Built Category. Indonesia Convention Exhibition (ICE) - BSD City, Sinar Mas Land. -	BCI Asia Awards 2017, Top 10 Developer. Sinar Mas Land. - MIPIM Asia 2017, Best Urban Regeneration Project. Kalijodo Park, Sinar Mas Land. - Economic Challenges Awards 2017, Properti dan Real Estate. PT Bumi Serpong Damai Tbk. , Sinar Mas Land. - Best Innovative Networking Marketing. Price Amnesty, Sinar Mas Land. - Asia Pacific Property Award. Sinar Mas Land, Developer Website - www.sinarmasland.com. - Best Township Development Project. BSD City, Sinar Mas Land. - Most Influential Professional. Ishak Chandra, Sinar Mas Land. - Asia Pacific Property Award. PT Bumi Serpong Damai Tbk., Residential Development - Cluster de Brassia. - Asia Pacific Property Award. The Breeze Lifestyle Center, Retail Development. - Asia Pacific Property Award. Sinar Mas Land, Development Marketing - Building a Stronger Image for Sinar Mas Land. - FIABCI World Prix d’Excellence Awards 2015. The Breeze Lifestyle Center, WORLD SILVER WINNER Retail Category. - The Global CSR Awards 2015. PT Bumi Serpong Damai Tbk., CSR Leadership Award . - BCI Asia Award 2015. Sinar Mas Land as Top 10 Developers. - Property & Bank Award 2014. Sinar Mas Land, Property Developer with The Largest Customer Service Center. - SWA Award 2014. PT Bumi Serpong Damai Tbk., 1st Ranking of INA The Best Public Companie Based on WAI 2014 Category Real Estate. - Warta Ekonomi Social Business Innovation Awards 2014. Sinar Mas Land, Special Recognition Sustainable Green Development Property Award. - Properti Indonesia Award 2014. BSD Green Office Park, Commercial Project, Sub category: Office Building dengan Title: The Finest Concept Office Building. - Properti Indonesia Award 2014. PT Bumi Serpong Damai Tbk., The Best Performance, Category: In Growth Of Profit. - Economic Review 2014. PT Bumi Serpong Damai Tbk., 1st Ranking of Public Listed Company in Property & Real Estate Sector. - Indonesia Green Awards 2014. PT Bumi Serpong Damai Tbk., Water Preservation Treatment. - MNC Business Awards 2014. PT Bumi Serpong Damai Tbk., The Best Listed Company Real Estate Sector. - Forbes Indonesia Award 2014. PT Bumi Serpong Damai Tbk., Best of The Best Awards 2014. - Forbes Indonesia Award 2014. PT Bumi Serpong Damai Tbk., 3rd Ranking of Best Performing Companies in Indonesia. - Marketing Award 2014. Sinar Mas Land, The Best in Green Marketing. - Marketing Award 2014. Sinar Mas Land, The Best in Experiental Marketing. - Indocement Award. PT Bumi Serpong Damai Tbk., The Best Innovation in Customer Satisfaction. - National Energy Award. PT Bumi Serpong Damai Tbk., Pemenang I - sub kategori Gedung Tropis: The Breeze Mall. - ASEAN Energy Awards 2014. Sinar Mas Land Plaza BSD City, Best Practice Competition in Buildings for Green Building Category. - Cityscape Awards Emerging Markets 2014. PT Bumi Serpong Damai Tbk., Commercial Project Award. - Building Construction International. Sinar Mas Land, Sinar Mas Land as Top 10 Developers. - Forbes Asia Best Under a Billion. PT Bumi Serpong Damai Tbk., The Best Listed Company. - Forbes Asia. PT. BSD. Tbk, Best of the Best Top 100 Companies. - BCI Asia Award 2013. Sinar Mas Land as Top 10 Developer. - ASEAN Energy Award 2013. Sinar Mas Land Plaza BSD City, Winner for Energy Efficient Building. - World FIABCI Prix D'Excellence Awards 2013. BSD Green Office Park, Winner for Sustainable Development. Sinar Mas Land Plaza BSD City, Runner up for Office Development. - South East Asia Property Award. BSD Green Office Park, For The Best Green Development Award. 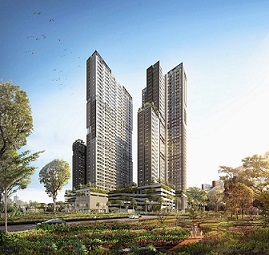 - Asia Pacific Property Awards 2013. Sinar Mas Land Plaza BSD City. Five Star Best Office Development Indonesia. Primavera of Foresta BSD City, highly commended for Multi-Units Development. - International Property Awards Asia Pacific 2012 For Office Development, BSD Green Office Park. - FIABCI Indonesia Prix D'Excellence Awards 2012. BSD Green Office Park, Winner for Sustainable Development. Sinar Mas Land Plaza BSD City, Winner for Office Building. Hotel - Le Grandeur Mangga Dua, 2nd Winner for Hotel. - South East Asia Property Award. For The Best Green Development Award. - Sustainable Business Awards. BSD City, for the Best Infrastructure. - Business Review Awards as the Best Corporate Communication. - 100 Best Wealth Creator Award Indonesia from SWA Magazine. - Sustainable Business Award from KADIN Indonesia. The Best Sustainable Development Companies. - Top 50 Companies Best of The Best Awards from Forbes Magazine Indonesia. - Asia Pacific Property Awards. For Office Development - BSD Green Office Park. - BCI Asia Awards Top Ten Developer. - Green Award for BSD, Indonesia Green Award for BSD La Tofie School of CSR and Business & CSR magazine. - Developer of The Year 2011 for Sinar Mas Land, The prestigious Developer of The Year Award for Sinar Mas Land from The Property and Bank magazine. - WORLD FIABCI Prix d'excellence Award - Cyprus, BSD City, 2nd Winner for Masterplan Category. - Green Award for BSD City. Indonesia Green Award for BSD City from La Tofie School at CSF and Business & CSR Magazine. - Bisnis Indonesia Award for Sinar Mas Land, An Award for Property and Real Estate Sector category from the biggest business newspaper in Indonesia, Bisnis Indonesia. - The Best Developer for PT BSD Tbk, Award given by PT Indocement Tunggal Prakarsa Tbk. - Recognition for BSD City Market Place, Acknowledgement for Pasar Modern (Market Place) BSD City, as traditional market with modern management from Yayasan Danamon Peduli. - Cleanest Environment Award for Balikpapan Baru Residential Project , The award granted by the city government of Balikpapan, most developed city in East Kalimantan, given to developers with project around Balikpapan on the occasion of the city anniversary. - Green City Award for BSD City, On the occasion of World Environment Day from the government of Tangerang City, Banten Province. - Properti Indonesia Award for BSD, Granted for the New City Project Initiator category as an urban development project being the first planned urban components, built by a private company with the largest land. - Green City Award for BSD, On the occasion of World Environment Day from the government of Tangerang City, Banten Province. - Adhika Niwastana Award, The prestigious Real Estate Indonesia award for Best Residential Project with less than 200 hectares category, by assessment on regulation, environment, facilities, and also infrastructure that meets the need of occupants living in a developed area. The award also given by considering points on efficiency, innovation, project management and aesthetics. - Top 1 KPR Referral Developer for Kota Wisata, The award given by KPR Merdeka of BII. - First new city in Jakarta-Bogor-Tangerang-Bekasi Jabotabek Area, From Properti Indonesia magazine survey based on macro and micro analysis, facility analysis, development prospects, and economic base.